 An agreeably fervid take on what makes Nike Inc. a consistent winner in the ultracompetitive sports-and-fitness trade. Accorded apparently open access, Katz (Home Fires, 1992) made the most of his unusual opportunity, capturing the in-your-face Çlan and imperatives that keep the company (best known for its athletic footwear) ahead of a pack that includes the likes of Adidas, LA Gear, and Reebock. Eschewing the more familiar forms of corporate history, he simply reports on the hectic pace maintained by Nike (named after the Greek goddess of victory) over a turbulent 17-month span that began shortly before the Summer Olympics of 1992 and ended at the start of this year. In the course of tracking Nike minions in venues ranging from corporate headquarters (in Beaverton, Ore.) through Europe, Pusan, South Korea (site of key manufacturing facilities), and inner-city shoe stores, the author provides just enough background on how the company managed to become a multinational force to keep his running commentary on contemporary events in clear perspective. Katz offers something for almost everyone in his vivid warts-and-all accounts of the moves made by Nike's executives, high-profile spokesmen (Michael Jordan, Bo Jackson, et al. ), and lesser lights. Sports fans get to meet superstar athletes up close, while armchair investors can focus on the megabuck rewards afforded by an organization whose annual revenues top $3.9 billion barely two decades after its founding. In like vein, students of psychology can make what they will of the author's efforts to explain how a global enterprise is able to sustain its entrepreneurial drive in a long-distance race with no apparent finish line, and trend spotters may wonder at Nike's uncanny capacity to keep one step ahead in fashion while not breaking faith with the world-class athletes and wannabes who gave the company its jump start. 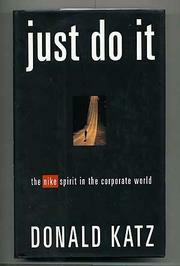 An engrossing and illuminating appreciation of a distinctive corporate culture.